Who are Nom Nom Kids? Nom Nom Kids are run by mum of two, Suzanne. 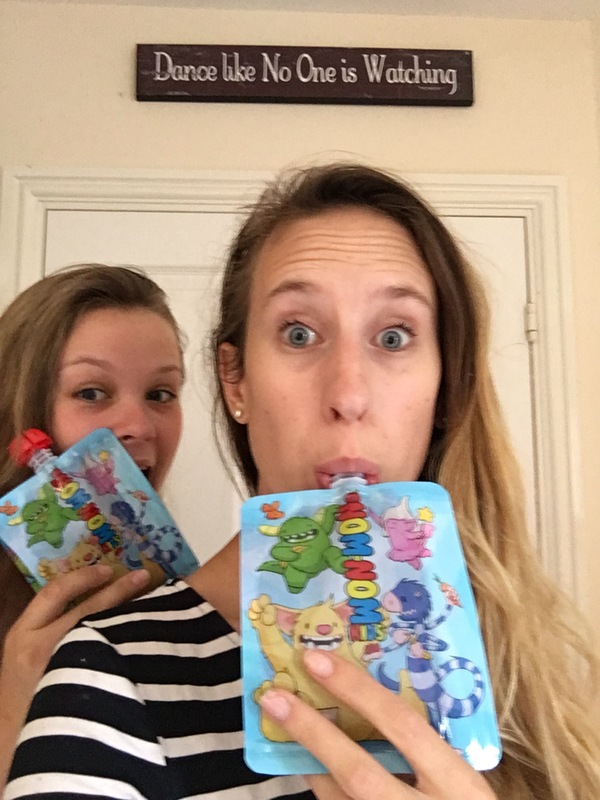 Inspired by her own want to be able to fill shop-bought pouches with her own pureed creations, and also her desire to be more sustainable (pre-filled pouches are non recyclable), she began developing the Nom Nom Kids range. Nom Nom Kids have small range of reusable food and snack pouches. The reusable food pouch looks just like the pre-filled ones you buy in the supermarket, but differing from those in terms of material it is made from plastic and is BPA, PVC and phthalate free. You fill the pouch using a ziplock opening along the side of it, and they are freezer and dishwasher safe. To see a video of the pouch being filled, click here. Just like pre-filled pouches they are not microwave safe but can be heated by putting the pouch filled with food into a bowl of hot water. 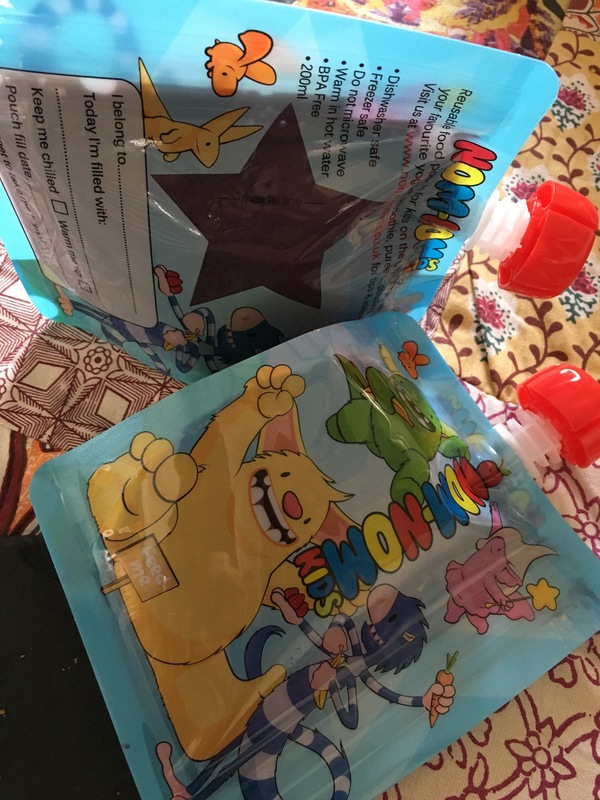 The pouches come in two sizes; 140ml or 200ml and they can be bought in a range of options. 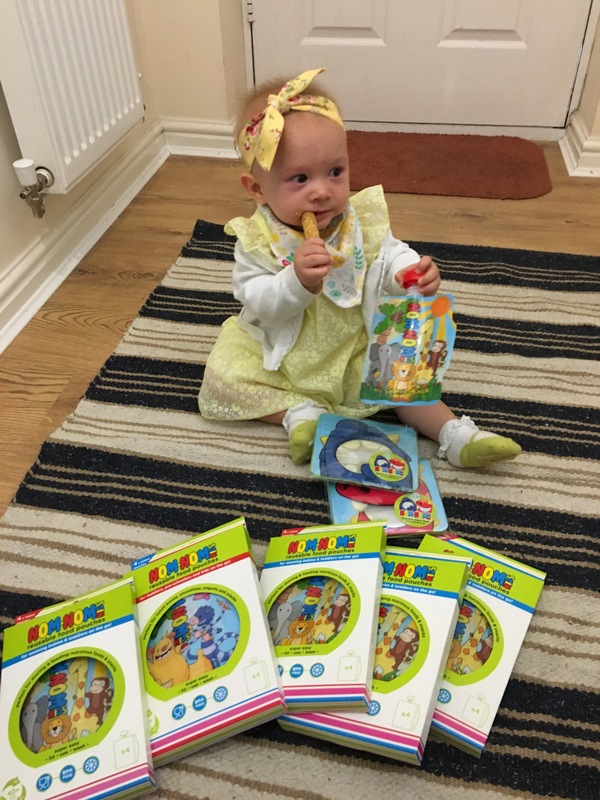 To buy singly they cost £2.95 or £3.25 but multi-packs and selection packs are also available, including a ‘weaning kit’ that is currently on offer for £18 (price right at time of publication). Nom Nom Kids have also more recently developed an accompanying snack pouch. I would best describe this as a sturdy plastic ziplock bag and I actually think this may be my favourite product within their range. 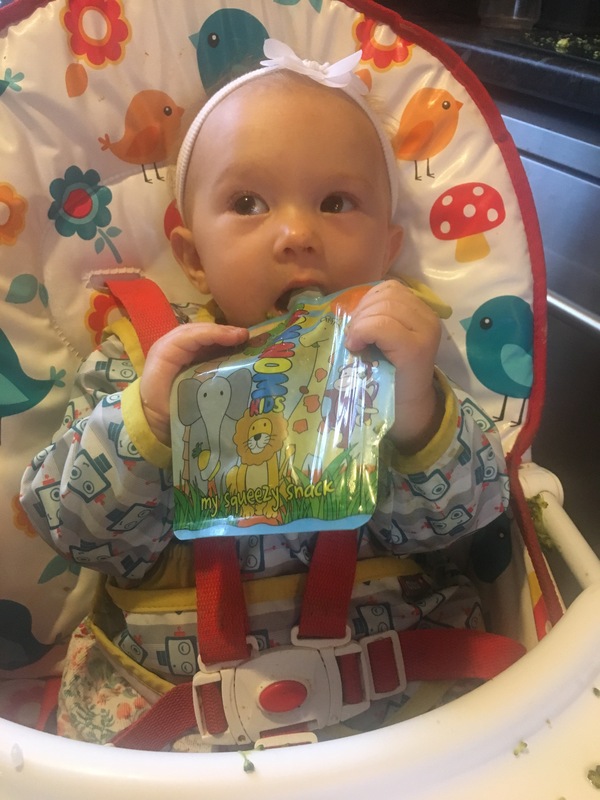 As we have taken a more baby-led weaning approach it has been great for popping in little finger-foods for baby H to have while we are out and about. I love the physical appearance of the pouches. They are fun and colourful and therefore would appeal to older children that are filling them with age-appropriate snacks like smoothies or yoghurts. It is nice that they have a section to write your child’s name too, especially as these seem to be overtaking Gloucestershire and are popping up in every changing bag and lunch box! The pouches don’t really have an age limit, which is a really appealing factor to me. 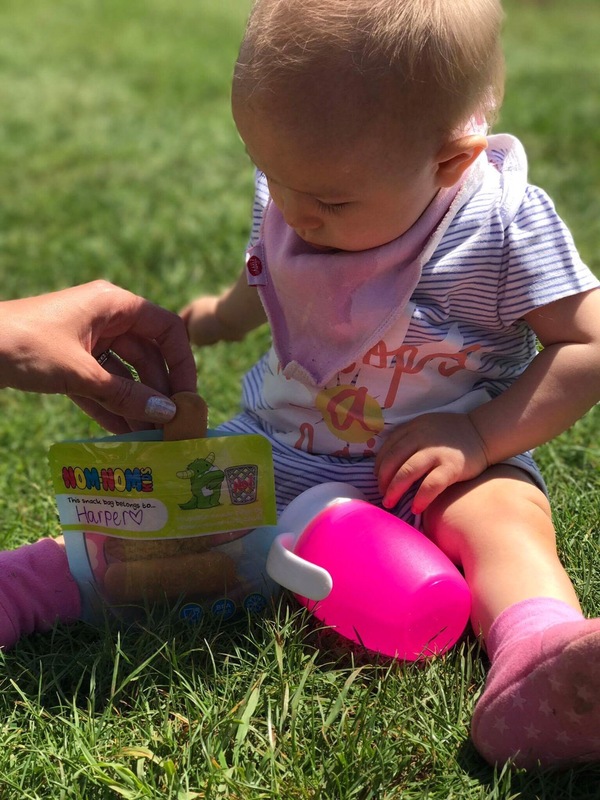 Whilst they can be used in the early stages of weaning for purees, they are also suitable to pop into a lunch box for older children – a tip I recently was told is to pop them in frozen to help keep the rest of the lunch cool! I must admit that in a mad dash I have even chucked my smoothie into one to eat on the go, it was brilliant – such minimal mess! The pouches are a good size, and they also free stand so when you are pouring the food into them you don’t need to hold them. I really like the fact that you don’t need any extra equipment to use the pouches as I have seen with some similar concepts; you buy a pack of pouches with lids and as long as you have a way of creating the puree (we use a Russell Hobbs smoothie maker available from Amazon) then you are ready to go. You can freeze them too which is AMAZING as means you can bulk cook, fill them, pop them in the freezer, and then just take one out as and when needed. I have been impressed by how easy to clean they are and their durability as the pouches are still in like-new condition after multiple washes. I think they are great value for money as they can be used time and time again. For baby-led weaning the range may not be as beneficial as I have found it. The pouches are obviously for “liquidy” food, and the snack bags aren’t overly big so sometimes I find myself still having to bring out small tupperware. However, I have found the pouches great for giving food that would otherwise be spoon fed such as yoghurt as she can then eat this herself with minimal help from me. I would definitely recommend Nom Nom Kids products. They are easy to use, good value for money, asthetically appealing, and good for the environment as help to reduce the amount of non-recyclable pouches making their way to landfill – what more could you want? 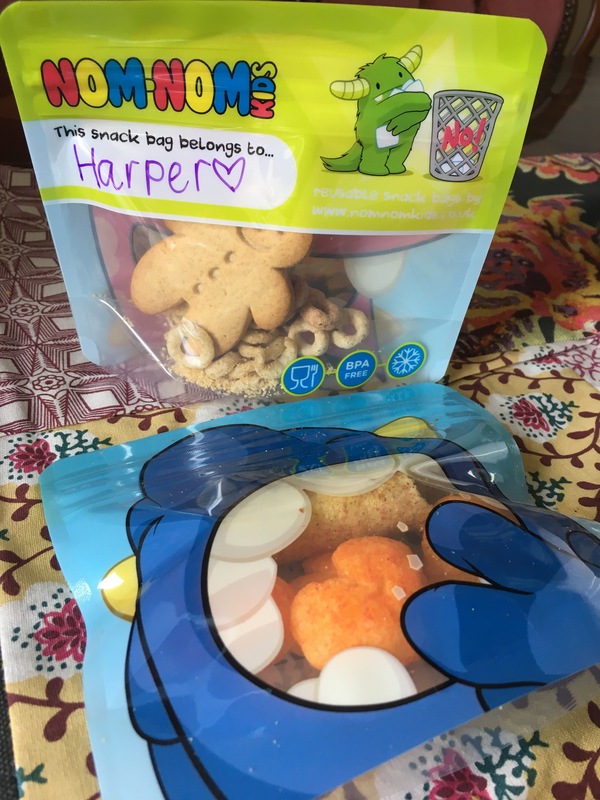 We have been sent products to trial from Nom Nom Kids, however we have also bought from the range too demonstrating a genuine love for these products. To see more from Nom Nom Kids and to purchase their products, visit their website. You can read about H’s weaning journey here. Guess i should try them soon! !